Over the past 20 years, the concept of DevOPs for the Database has always been around, but the ability to automate tasks hasn’t been as simple for the database as it has been for application development. 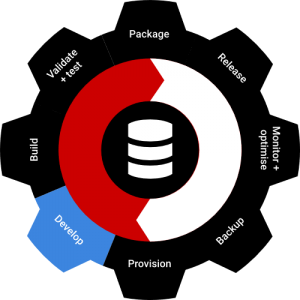 Database DevOPs tools have now matured considerably and the benefits of including DevOPs for the Database are being realised by many organisations to achieve greater operational efficiency. The storing of all database code, from initial schema creation scripts to each iterative modification, allows for a known good state of a database in a particular environment at a particular point in time. This enables many database developers and DBAs to be confident in the state of play of what is happening in the database environment. All changes that are being created and deployed require tests to verify the change being made meets the requirements and doesn’t break or cause issues to the deployed environment. Tests should not be an afterthought of a change, and should drive the change based on the particular requirements. The process of being able to apply small changes through the various environments, utilising unit tests and using the same automated repeatable process, is possible with DevOPs for the Database. Importantly, with this process in place, ‘hot fixes’ are no longer made to the Production environment, avoiding unexpected problems and giving us the confidence to deploy to Production confidently. SQL Masters Consulting, a traditional database management consultancy, incorporates DevOPs for the Database principles to assist our clients with keeping pace with the ever-increasing velocity of change. We would love to help you on the journey to getting DevOPs principles and practices applied to your database.